Button mushrooms are the most consumed mushrooms in the United States, accounting for 90 percent of mushroom intake according to the United States Department of Agriculture. Also referred to as white button mushrooms or commercial mushrooms, they are available year-round and are used in soups, salads, casseroles or eaten raw. A look into the health benefits of this widely consumed fungus may prompt you to add more to your diet. Heart disease is a leading cause of death throughout the world, but consuming button mushrooms can keep you from becoming another statistic. A major risk factor for heart disease is atherogenesis, which is the formation of plaque on arterial walls, which causes atherosclerosis and hardening of the arteries. Researchers at Arizona State University tested the effects of button mushrooms on the human endothelial cells in a test tube. The results of their study, published in the July 2010 issue of "Nutrition Journal," show that button mushrooms reduce inflammation in arterial cells and prevent white blood cells from sticking to arterial walls. The researchers conclude that consuming button mushrooms may be a means to prevent heart disease. Specific cells in the body, referred to as natural killer cells, respond rapidly to foreign invaders such as viruses or cancer cells. Their rapid response is crucial to the immune system, as it helps the body fight disease. The June 2007 issue of the "Journal of Nutrition" reports that eating button mushrooms can boost the immune system by increasing the activity of natural killer cells. Although they do not fully understand how, scientists believe that it is the polysaccharide content of the mushrooms that is responsible for their immune-boosting ability. Button mushrooms protect the body from various cancer cell lines. In June 2010, the department of plant pathology at Penn State released a report stating that button mushrooms have been found effective at treating breast, colon and prostate cancers. According to a study in the December 2006 issue of "Cancer Research," eating one 1/2 cup of button mushrooms a day can stop the growth of breast cancer tumors. A healthy woman may eat less than 1/2 cup to greatly reduce the risk of developing breast cancer. Button mushrooms contribute to the recommended daily intake of several vitamins and minerals. The USDA reports that mushrooms contain high amounts of copper, which is needed to produce blood cells and maintain heart health. Additional nutrients are vitamins C, D and B; and the minerals selenium, iron, magnesium, phosphorous, potassium and zinc. When cooked, most of the nutrient content of mushrooms remains the same, while some nutrients lose between 5 and 20 percent of their value. "Nutrition Journal"; Both Common and Specialty Mushrooms Inhibit Adhesion Molecule Expression and In Vitro Binding of Monocytes to Human Aortic Endothelial Cells; KR Martin; Jul. 16, 2010. 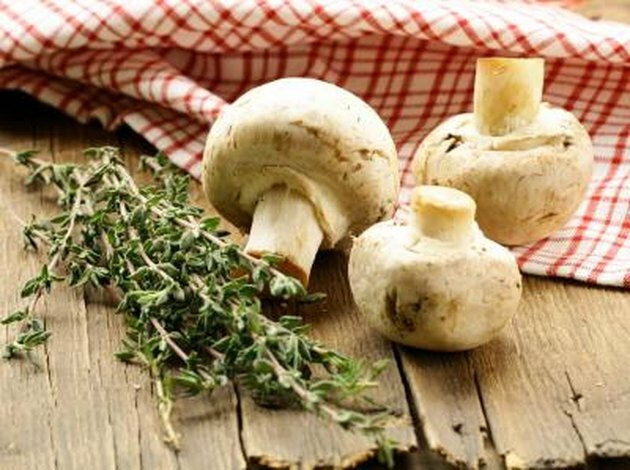 "Journal of Nutrition"; Dietary Supplementation with White Button Mushroom Enhances Natural Killer Cell Activity; Wu Dayong, et al. ; June 2007. Department of Plant Pathology at Penn State; The Anticancer Activity of Agaricus Bisporus Against Human Cancers; Tongtong Wu; June 12, 2010. "Cancer Research"; Anti-Aromatase Activity of Phytochemicals in White Button Mushrooms (Agaricus bisporus) ; Shiuan Chen, et al. ; Dec. 15, 2006.